In 1938, one of the acts congress added nationally was the minimum wage law to help us get past the Great Depression, although many states had such laws dating back to 1912, they applied only to women and children. Myself personally, I have seen minimum wage double itself just in the years I’ve been part of the workforce and I seem to barely be able to stay one step ahead of it.. however, there seems to be a loophole in the minimum wage laws, one group of workers who employers are not required to pay the same as everyone else.. waitresses.. It seems that the “Federal Fair Labor Standards Act” separates people by their jobs.. and there is a class of employees they call “Tipped” that fall into the rule that says “The employer must pay a set wage, that when added to the tips the employee makes, equals or is more than minimum wage” and if it is lower, the employer is required to make up the difference. When we go out to eat, this is the reason we are expected to tip the waitresses.. Is passing this part of the employees wage onto the customer a good idea? If there were no tips, the employer would have to pay more in salary which in turn would have to be passed onto the customer so they could stay in business.. regardless how we look at it, the money will need to come from us and I can see why it should.. it lets the waitress know how we think about the service we receive, did they keep up on our drinks? were they polite and helpful or did they ignore us.. 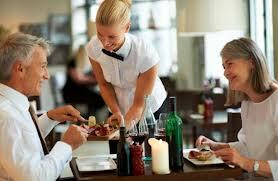 Normally, with few exceptions, I always tip around 20 percent of the bill.. I have found rude service (ignored or treated disrespectfully) and still managed to throw a couple dollars on the table.. I can not imagine not leaving something..
which brings us to Saint Louis, January 25th 2013. Alois Bell, 37, a preacher at Truth in the World Deliverance Ministries Church, enjoyed a large dinner with friends at the local Applebees restaurant. When it came time to pay for her meal, she handed the waitress her debit card and was shocked when the receipt came back suggesting a 18 percent tip. 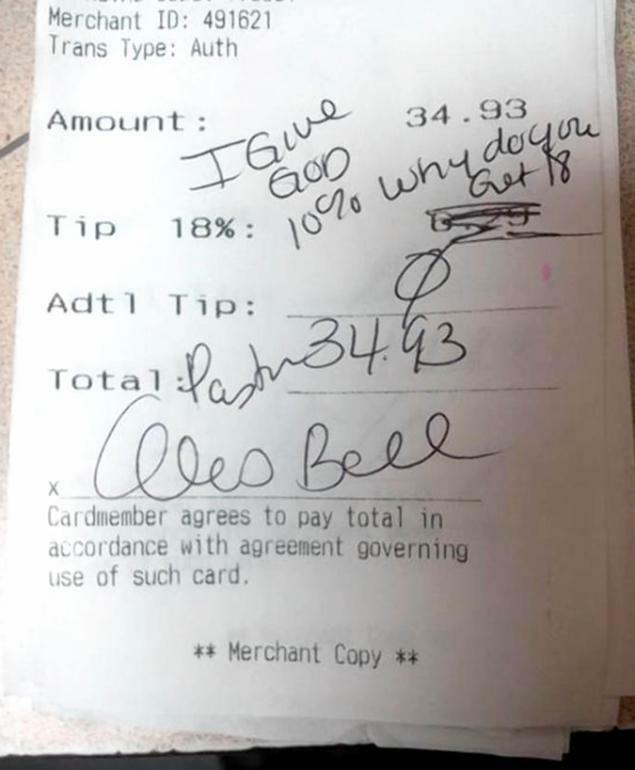 In her anger at reading this, she wrote “I give God 10%, why would do you get 18%?”.. She then crossed off the expected tip and wrote “0” as the amount. I’m sure her waitress was angry at seeing this but what could she do? Mrs. Bell and her friends left and the table was cleaned and the next customers were given the booth. This could have been where the story ended except for one thing.. another waitress who worked there happened to see the receipt, took a picture of it and posted it on a social network site called Reddit. This second waitress, Chelsea Welch, commented “”I thought the note was insulting, but it was also comical. I posted it to Reddit because I thought other users would find it entertaining..” however what happened was the receipt went viral and somehow some of Mrs Bell’s friends saw it and informed her. She then informed Applebees who felt they had no choice but to fire Mrs Welch for posting the receipt (even although it doesn’t show the restaurant name or any debit card numbers for Mrs Bell). On facebook, there are sites that exist today who feel sorry for Mrs. Welch and want Applebee’s to give her back her job, many people have offered to pay the tip and some people have even managed to find and harass Mrs Bell over her “lapse of her character and judgement”. Before we judge Applebees, here is their official statement..
We appreciate the chance to explain our franchisee’s action in this unfortunate situation. Please let us assure you that Applebee’s and every one of our franchisees values our hard working team members and the amazing job they do serving our guests. We recognize the extraordinary effort required and the tremendous contribution they make, and appreciate your recognition and support of our colleagues. At the same time, as we know you will agree, the guests who visit Applebee’s — people like you — expect and deserve to be treated with professionalism and care in everything we do. That is a universal standard in the hospitality business. That includes respecting and protecting the privacy of every guest, which is why our franchisees who own and operate Applebee’s have strict policies to protect personal information — even guest’s names. – A guest questioned the tip automatically attached to her large party’s bill by writing: “I give God 10%. Why do you get 18?” on the check. – A different server, who did not even wait on the group, photographed the receipt, posted the photo online and commented about the incident. – The guest subsequently heard from friends who identified her from the posting, where her name is clearly visible, and the restaurant was notified. There was no further communication with the guest. – The team member was asked about posting the receipt and admitted she was responsible. suppliers, agents or competitors, without first obtaining written approval from the Vice President of Operations. The policy goes on to specify: Employees who violate this policy will be subject to disciplinary action, up to and including termination of employment. – As a result of her admission to violating a clear company policy intended to safeguard guests, the team member is no longer employed by the franchisee. Our franchisees are committed to acting in the best interests of guests and team members. This is a regrettable situation and we wish it had never happened. However, the disregard for an important policy left the franchisee no choice but to take the action they did. We hope this provides you with some additional insight. Thanks for giving us the opportunity to explain the facts involved. I believe that Mrs Bell, (a person who I would hope attempts to set an example of living as God would want us to), got “holier than thou” in her reply on the receipt.. yet she was wronged far worse by having the receipt posted than the friend of the waitress who took it upon herself to show the billions of people on the internet just how stupid some customers can be. Chelsea, by posting that receipt that belonged to the restaurant, opened them up for a lawsuit just so she could have a few laughs? I don’t blame Applebees for terminating her and I hope she understands why she was wrong. There was no winners in this.. Applebee’s now, due to the public exposure of the case, is taking a lot of bad press by people feeling they fired someone for sticking up for her rights and people are swearing to boycott the restaurant. They did nothing wrong. This Minister, who through the actions of one dinner, is now receiving threatening phone calls and being harassed and some young girl who just lost her job has gained notoriety in it’s place. The one person who is missing from this story happens to be the young lady that waited on the table in the first place. She seems to be the only person who was thinking clearly that day.. The next time I sit down at a restaurant for dinner, I shall think about what happened.. I know the waitress deserves the tip and it’s just a little way I can tell her “Thank You”.. I know I’m not easy to wait on, I like things prepared without this or with extra that and when they bring me the food.. I know it’s because the waitress was listening to me. Perhaps they should do away with the entire tipping thing and just pay waitresses what they pay the cooks.. or perhaps things should stay like it is and allow us, the customer, to say “thank you” in our own way..